Viking Brothers is rated 3.9 out of 5 by 50. Rated 5 out of 5 by geogirl1963 from Very fun I have had a blast playing this game. I love the up beat catchy music. I like everything about this game. This is just an outright fun game!!!! Need more like it!!! Rated 5 out of 5 by jiferin from I must disagree I must disagree with some of the reviews I have read from those who played the demo. At first, I will grant you, it is a simple collect resource kind of game, but later it gets better. I am always so desperate for a TM that I bought this one because it was new. By the time I got to the swamps I began to appreciate the game a great deal more and was pleasantly surprised. Rated 5 out of 5 by muhukohuk from Great little TM game Great story, comprehensible tutorial, I liked gameplay a lot. Graphics could be a little bit better but I liked it the way it is. Rated 5 out of 5 by Meska from Simple, but exciting Played all 50 levels. This game really surprised me. It's not so easy to get the gold on all levels. Funny "horned" vikings, and other cute characters. Storyline is typical, and have a lot of talking, but it's okay. This is my new fave game along with kingdom chronicles and northern tale. Rated 5 out of 5 by amgood49 from Another good game Yes it is the typical tm game which i love, challanging myself is great to get the gold. level 6 drove me crazy played it for hours before i finally realized you can catch fish for food, makes it a very easy tm game on most levels bit more thinking on the others. Rated 5 out of 5 by Reuiz from Nice TM Game Yes, it's a fun game. I like tm games and this one doesn't disappoint me. 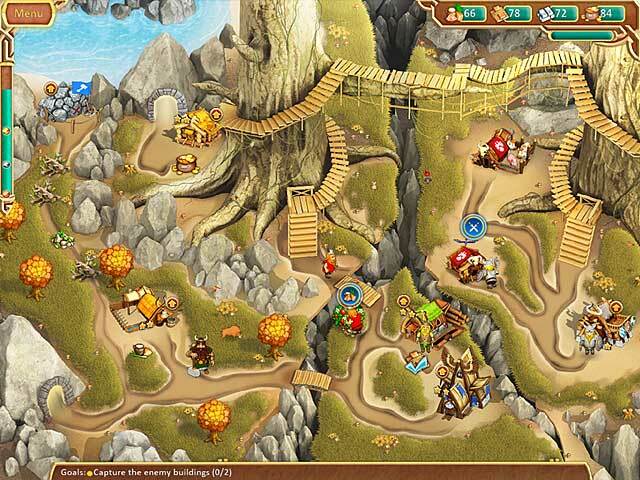 Cute characters, many different tasks and quests. Graphics can be better, sound and storyline is okay. There is a no relax mode, but you can play after timer. Also you can click to schedule tasks in advance, and no need to wait until the worker is became available. Some levels are really challenging to get gold, and you need to plan moves on start. Rated 5 out of 5 by Developer_Gamer from Very nice TM-game! I really like TM games! And I really happy when some of it relised. Rated 5 out of 5 by Csustar from TM/Strategy This is great, been waiting for a great TM/Strategy game. Gets more difficult than first appears, as I thought would be a little lame, but you really have to pay attention about your strategy so you get gold. Game lets you replay level, and you can right click on any of your jobs to undo. Graphics are not the absolute best, but good. I never do the sound, so can't comment on that, but being starved for a good game this really fills the bill. Rated 4 out of 5 by daphnesttng from Problems with Bonus Levels Loved the game but can not get past level 1 of the bonus. Rated 4 out of 5 by Henry1099 from Nice Game I played the game last weekend and enjoyed it - good grahphics, hard levels - just how it should be. Rated 4 out of 5 by MaddaKat from Fun Game This is a good game with a fun story and enough challenge to keep it interesting. The graphics are very good and it moves along nicely. Well worth buying. Rated 4 out of 5 by keldra1024 from cute fun it is a bit distracting at first to have the two brother characters moving around on the game board because they don't really do aything except 'supervise' the workers. otherwise, it is a fun game. Rated 4 out of 5 by aussiekids from Road clearing resource & time management Starts off easy and increases just the right degree of difficulty with each step, If you like My Kingdom for the Princess you will enjoy this too. Rated 4 out of 5 by alsteele28 from Invasion of the vikings! This review will not be too indepth as these games have been done a lot before (think any 'clear the path' style of games. I will therefore just go into the differences between this game and others of this subgenre of the TM genre. The game itself is nice and colourful and the graphics do the job very nicely. The game is basically about two brothers. The game is intuitive in that there is no 'empty-handed' syndrome as I call it. By this I mean if the any of the characters are empty handed they can be directed to do other tasks without them having to go back to their 'home' and back out again, (I always feel in other TM games that this is wasteful (not only of my own personal time but of the game-time, and I am sure I have lost out on an 'expert' score because of this (possibly :)), this game doesn't and another bonus is that you can queue up jobs so that when one task is completed the character knows what job is next. This is good as on others the game would not let you do this. Another great improvement of the game was that if you clicked on a building or bridge or anything that needed repairing and you had not got all the resources it would highlight (by blinking), the resources that were required (such as trees if wood was required, or the gold mine if more gold was required), this to me was a huge step forward as it showed in graphic detail exactly what elements were needed, to build the building, bridge etc. Also I liked if you tried to click on something and the path was blocked then there would be footprints up to where the path was blocked indicating what needed to be done to unblock the path. This again was good as on some games it may not have always been obvious what needed to be achieved to clear the path. There were other touches that I felt enhanced the game, but I will leave these for you to discover :) (or to put it another way I sure there will be other things that enhance the game-play I just haven't discovered them yet. :), The graphics are nice and 'chunky' (this is not in a negative, but I mean they are clean and bright and solid), the music is a much of a muchness, but I guess does the job (as I have said before these games are not necessarily played for their soundtrack). This game for me is a definite keeper, I have loads of this style of game but there is always something slightly different in them that makes me want to add others to my collection. I wholeheartedly recommend this game. This is the 'clear the path' style of TM that is popular on Bigfish. Rated 4 out of 5 by pennmom36 from A little slow but still fun! A good TM game, fun to play, just not as good as some of the recent TM games of late. This is just a point and click on the desired action such as click on the resources of gold, food or supplys or click on buildings for upgrades or repairs. 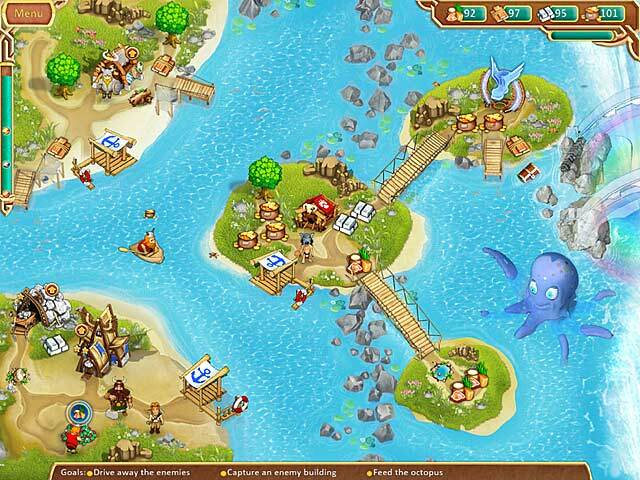 You must clear pathways, go fishing or chase away the bad guys. There is no destroying or placing of gardens or housing just clicking which was a little disappointing, but this is still a fun game. Enjoy! Rated 4 out of 5 by witchywoman46 from Fun, clever game I may have to buy this one. The hour trial went by way too fast. I like TM games and this one was fun, not too easy, not too hard. Very enjoyable. Rated 4 out of 5 by themaestro023 from Fun TM game Just bought this (used a game credit) after playing the full one hour demo and didn't notice the time fly by. It's quite a nice TM game. I skipped the tutorial as have played TM games before and you probably won't need it if you've played them yourself. Music is a little annoying but this can be turned off although the sound fx are quite good. I am using the game cursor as it's hard to spot the system cursor when playing. Quite a good level of challenge, there are a few levels I haven't made gold on yet so will have to go back and play it again which means it will last a while. I'm only up to level 10 and I assume there are about 30 odd levels, so it should relieve the boredom for a few hours. If you're tired of all the so-so HO games around at the moment, give this a go for a bit of fun. Would recommend. Rated 4 out of 5 by julie65608 from The game It is an ok game as far as this type of game goes. I wish the graphics were better. It is fun. Not a waste of money if you like this form of game.I bought it. It just had the potential to be so much better. Rated 4 out of 5 by karenkirchner from fun cute. no ugly creatures or characters....yet. typical TM game...collect, build, improve, find stuff. I am going to use a credit for it. I like the fact you can put a check for the tasks that are allowed ahead of time to keep the characters all moving. colorful but not as advanced as my kingdom. Rated 4 out of 5 by y_komatsu from Basic TM game It's fun for me to play TM games. 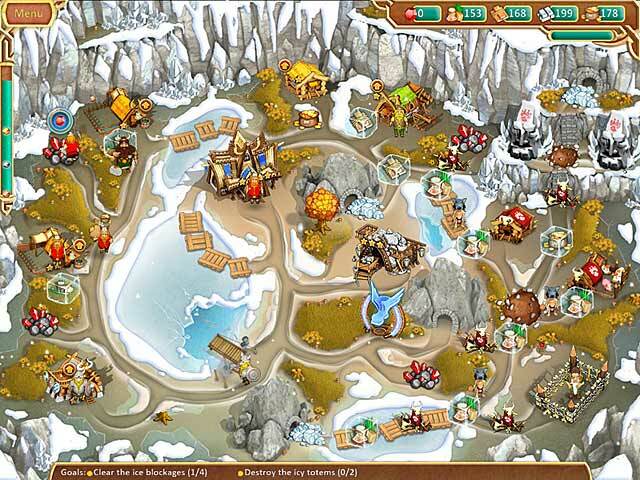 "Viking Brothers" is basic TM game. I like it! Rated 4 out of 5 by sandygetz from like it kinda cool it ws pretty cool you can do either one relaxed or time mode. I did the relaxe one till i got the hang of it and to where i can study it better then went on to do the time one. Rated 3 out of 5 by joanig from Why so much talking! The game itself would be good if there wasn't so much dialogue . Rated 3 out of 5 by _balance_ from What's with the racist story? Cute graphics, fun enough gameplay, but I wanted to exit before I even started when it introduced indigenous-looking "evil savages" and their shaman who wanted to destroy the Tree of Life! What?! I did eventually exit when the story again threw in the "savages" and I'd seen and heard enough of that kind of outdated racist depiction of indigenous peoples and a derogatory word for them. It wouldn't be hard to make a story without that, so why did they? Games don't need bigotry. I'd hate to have my kids play this and then start talking that way at school. Rated 3 out of 5 by Circe7 from Bog Standard This game did not compel me to buy. It offers no surprises. If this is the first Time Management game you buy, you'll probably be quite pleased, however, if you've played many before this is same game - different name. Rated 3 out of 5 by rolliby from Viking Brothers is OK But Needs Umph I play quite a few of these type of games on a regular basis. 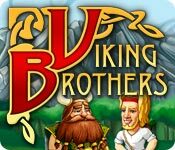 Viking Brothers is alright, but a bit too elementary for my tastes. There isn't enough individual building projects to make it challenging. (Think Roads of Rome). Nice try though. Enjoy 50 levels of rollicking time management fun, learn the heroic ways of the Vikings and experience an epic story of love, valor and legend!